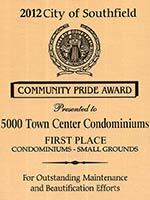 The City of Southfield and the Southfield Parks and Gardens Club awarded 5000 Town Center first place honors in its 2012 Community Pride Awards. The 5000 Town Center tower sits on 5.5 acres of park-like, manicured grounds in the heart of Southfield’s City Centre. At 33 stories it the tallest residential condominium in the state, providing spectacular panoramic views of Southeast Michigan. The tower’s more than 300 residents share the luxury of full-service, hotel-like hospitality and a distinctive lifestyle of comfort, convenience and security. Amenities include valet service, 24/7 front desk concierge, wi-fi access, a heated pool, a fitness center, and the Evergreen Hills golf course in the nearby Southfield Municipal Complex. 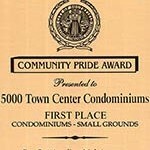 More information is available at www.5000towncentercondo.com. The 2012 City of Southfield Community Pride Awards will be presented on October 15 in a 5:30 p.m. ceremony preceding the City Council meeting.